Join us on Sunday 7 April for our annual Easter Egg Hunt. Beckington Pre-School is a friendly village Pre-School. The sessions are held in the Baptist Church Hall in Beckington, which is a light and spacious venue. We have an excellent selection of toys, books and equipment. We also have a lovely garden area available for outdoor play all year round. We accept children from 2 years until school age and offer 2 and 3 year old funding. Places currently available, please contact us for more information. Sessions are carefully structured to offer a tailored curriculum leading to approved learning goals. We also believe in making the most of each day, so we often enjoy what the weather brings, be it sunshine or snow. Individual care and attention is made possible by a high ratio of adults to children, helping to increase the children’s ability to concentrate on each new discovery. There are opportunities for you and your family to be directly involved in the activities of the group and in your own child’s progress. Our main aim is for your child to learn happily through play, ensuring individual attention to the needs and development of each child. In the warmer months the staff take some of the indoor sessions outside where children can enjoy learning in the fresh air whilst seated on rugs beneath the new sail shade. We also go out and about around the village on walks to explore our local environment, which the children love. These adventures occur all year round. 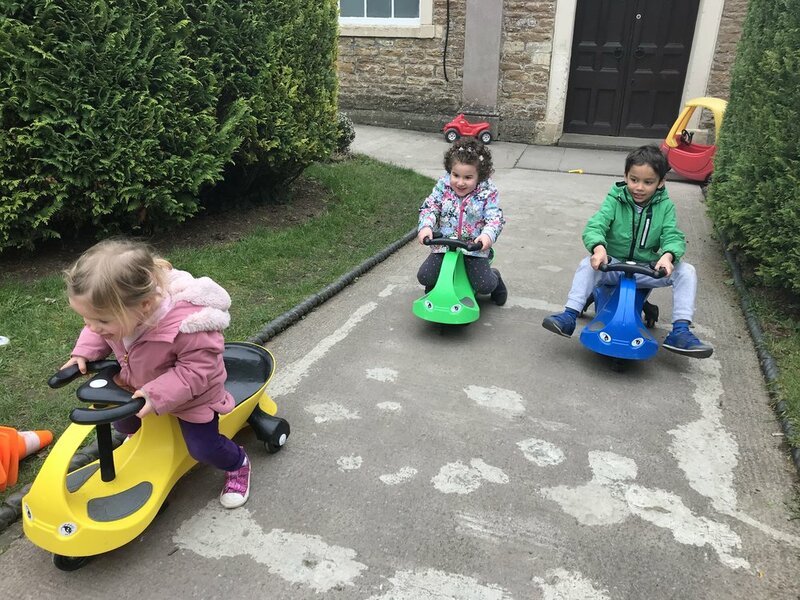 Our overall aim at Beckington Pre-School is to provide a happy, calm and stimulating setting that provides a successful teaching and learning environment. This promotes the children’s healthy development. We follow the Pre-School Curriculum where there are 7 areas of learning and development that shape educational programmes in early year's setting. All areas of learning and development are important and inter-connected. 3 of these areas are particularly crucial for igniting children's curiosity and enthusiasm for learning and for building their capacity to learn, form relationships and thrive. The specific areas include essential skills and knowledge. They grow out of the Prime areas and provide important contexts of learning. With the planning every term at Pre-School we try to incorporate all areas of learning especially concentrating on the Prime areas. When you visit us it will appear obvious that the children spend a great deal of time playing. Play has a serious purpose for each child – it is his or her main learning tool. Play offers the child a means of exploring and understanding the world – the way it works, the people in it and his/her place in it. We welcome the interest and support of parents in all aspects of Pre-School. We try to keep parents and carers well informed about what the children are doing. Because our Pre-School is small, we find it easy to keep in regular contact with parents and carers and the staff are happy to have a quick word at the beginning or end of the day or an appointment can be made with the Pre-School Leader. At the beginning of every half-term the children bring home a Pre-School Newsletter informing parents/carers of events and activities that are happening. This Newsletter is also available in the news and events section. On the Newsletter you will find the sound of the week. Please encourage your child to bring in an object that starts with this sound. Each child is designated a key person who has particular responsibility for that child and keeps records of all areas of their development, achievements and progress. These records are used to produce an annual report for parents. Please feel free to make an appointment with the Pre-School leader to discuss your child’s progress at any time.